One of the most popular tourist destinations in Balasore is Chandipur beach. With the soothing natural and alluring beauty, it is a perfect place to relax and enjoy various water sports. Located 15 km away from Balasore in Orissa, Chandipur is a small sea resort blessed with divine beauty of pine and coconut trees. The beach features, one of the rarely seen qualities; disappearing away of sea water and then returning back, twice a day. The sea water moves away up to 5 km from the beach and then again return back, during high tide. The pristine sea water, green shores and the sandy beach attract tourists in great numbers. 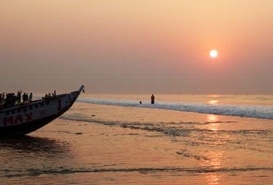 Although, due to its unique quality of ‘vanishing away’, the beach is packed with visitors all the yearlong; but the perfect time to visit Chandipur is during winter months. You can plan your visit between October and March when the temperature ranges from 17 degree Celsius to 26 degree Celsius. 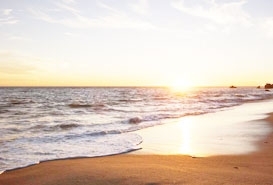 The climate is appropriate for sightseeing and you can relish the bright days on the sand. There are sufficient number of luxury hotels and resorts. 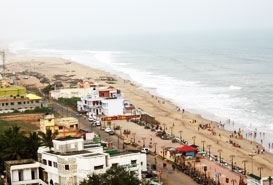 The accommodation options include the OTDC (Orissa Tourism Development Corporation) Panthanivas and the Yatriniwas. Other hotels you can go for are Hotel Larika, Hotel Chandipur, Hotel Shubham, Hotel Anandamayee and Hotel Santinivas. The restaurants here offer selections of Odia and Bengali cuisines. Locals here enjoy the sea food and fish, which are delicious and quite affordable. Some of the nearby restaurants to Chandipur are Magic Food, Jalpan, Aroma Restaurant and MAA Tarini Restaurant. You can conveniently travel to Chandipur beach by all modes of transportation. 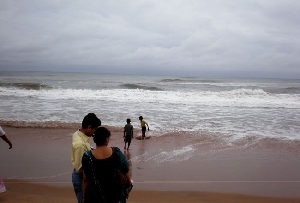 The beach is well-connected to all major cities like Delhi, Mumbai and Kolkata. Bhuvaneshwar airport is the nearest airport to Chandipur. Further, there are scheduled trains and buses to reach Balasore (around 178 km away) and then you can hire taxis or take buses to Chandipur (around 12 km away). The nearest train station to Chandipur is Balasore which is just 12 km away. There are number of scheduled trains running to different destinations to Balasore. Further, there is easy availability of buses and taxis to reach Chandipur. Either you can drive on your own or take buses from Kolkata. Banadurga travels, runs AC Volvo sleeper buses from Balasore to Kolkata. Further, hire taxis to travel to Chandipur. Other then sightseeing on the beach, you can also go for boat rides with the local fishermen’s or just walk along the beach.